I love cooking for others. There is something so satisfying about creating meals that nourish and succor the people I love and care about. In today's poetry title you will meet a cook who has to come up with meals for some very eclectic people, and whose dishes feed not just the body of these folk; they also comfort their hearts and sooth their minds. When the circus comes to town everyone comes flocking to the big top to see the trapeze artists, the clowns, the strongman, the performing animals, the human cannonball and other spectacular spectacles. What you might not know is that there is someone, someone in the background, whom all these colorful characters depend on. The chef cannot do a cartwheel, and high places make him “dizzy.” He could never be a clown because he doesn’t “make funny faces,” but without his culinary creations the performers would be in big trouble. The chef often has to create very specialized meals. For example, the ringmaster is on the go all the time, and so the chef has created a picnic for the man which can fit in the ringmaster’s top hat. No matter how busy the ringmaster gets, he always knows that under his hat he will find a little something to quench his thirst and fill his belly. Sometimes the chef has to literally come to the rescue with his delectable concoctions. When the strongman joined the circus he was homesick for his homeland, so the chef made him Russian treats and tea to comfort the big fellow. Then there was the time when the contortionist twins got themselves in a terrible knot. It was the chef who made them a tarte flambé, and when they smelled the tarte the girls were so delighted that their knot came undone. Some of the performers have been specific requirements. For example, Little Blue, the dog who jumps through hoops, will only eat soup, and if he is not given any “His perky ears will start to droop” and he will refuse to perform. This wonderful poetry picture book takes us into the world of circus performers, and gives us a taste of the challenges that they face as they practice and perform. Holding them all together, catering to all their needs (some of which are downright peculiar) is the chef, who slaves away day and night to take care of the people and animals who are his friends. Lets get the winners of the children's literature awards on the Ellen Show! Not long ago the American Library Association announced the winners of America's most prestigious children's book awards, which includes the Caldecott Award and the Newbery Award. Many of us in the children's literature world would love to see the winners of these awards on the Ellen Show. The staff at KidLitTV have created a short movie about their campaign that I would like to share with you. When I was growing up, I was naturally drawn to stories that featured children who broke the rules. Eloise, and many of the 'naughty' characters from Roald Dahl's books were my heroes because they prevailed in spite of everything. In today's picture book you will meet a fish who does something bad. He knows that what he is doing is wrong, but he does it anyway. The ending is rather surprising, and perfectly perfect, under the circumstances. One day a very small fish steals a hat from a very large sleeping fish. The small fish thinks that the large fish “probably won’t wake up for a long time,” and even when he does wake up the fish won’t notice that the hat is gone. After all, the hat is very small and the big fish probably barely felt it. Just in case, the little fish decides to hide in a place where the plants are “tall and close together.” A crab sees where the little fish is going but it promises not to tell anyone where the little fish is hiding. The little fish justifies the theft of the hat, which he knows was a bad thing to do, because the hat was too small for the big fish. The little fish makes it to his hiding place and swims in amongst the plants. He is so sure that “Nobody will ever find me,” but it turns out that many of the assumptions that he made were completely wrong. This beautifully crafted book, with its simple tale and cocky main character, will delight young readers. Children will be able to see how wrong the little fish is as he talks about what he has done and how to plans to get away with the theft of the hat. They will see that the little fish’s confidence and optimism is, alas, misplaced. Life is full of unknowns. Sometimes even the things that you feel sure about are not as secure as you thought they were. One of the hardest things for children to cope with is when something happens to a parent. When there is a divorce, when a parent dies, or when a parent walks out, the ramifications for the children in the family can be considerable. Today's poetry title takes readers into the heart and mind of a young man whose father leaves suddenly. The narrative is moving and powerful, and it shows readers what it is like to be a child who is trying to cope with this kind of devastating event. Learning how to work with others and cooperate is a lesson many children struggle with. They often prefer to do things their way. If there is a prize to be earned, they don't want to share it. They would rather struggle on their own than cooperate with others if it means that they have to share the prize. In this gorgeous picture book we see how a group of animals work together to try to get something and how, in the end, their cooperation gives them a gift that none of them expected. One snowy, bitterly cold winter’s day a rabbit leaves his burrow to try to find some food. Unfortunately, the snow is so deep that everything edible is buried. 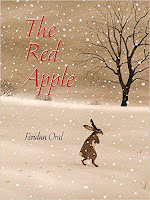 Then Rabbit sees a bright red apple hanging on a bare tree. Rabbit is delighted with his find and he quickly goes over to the tree. Only to discover that the apple is too far above his head. There is no way that Rabbit can reach the precious fruit. Rabbit decides to ask Mouse for his help, and Mouse is willing to do what he can, but it turns out that the tree is too big for such a small mouse to handle. Even when Mouse stands on Rabbit’s head the apple is still too high for them to reach it. Then Fox, who is feeling “a bit under the weather,” arrives on the scene. He tries to knock the apple off the tree with his tail, but his efforts are no more successful than the earlier ones were, and the apple, very stubbornly so it seems, stays firmly attached to the tree. In this beautifully written and visually stunning picture book, Feridun Oral shows his readers how cooperation sweetens life in more ways than one. The ending will warm the hearts of readers of all ages. Concrete poems give poets a means to entertain readers with word magic and graphic art magic. I encountered this form of poetry relatively recently and have seen first hand how excited young children become when they see how the words in a poem can be used to create a picture. This wonderful book is packed to the gills with lots wonderful concrete poems that tickle the mind and delight the eye. Many people love spending time at the seaside, paddling in the waves, and exploring ocean worlds. They are fascinated by the creatures that live underwater; the fish, turtles, jellyfish, stingrays, eels and other animals. In this delightful book Betsy Franco’s clever concrete poems are paired with wonderful artwork to give readers a memorable journey into the world of sun, sea, sand, and “sea critters.” The words on the pages are arranged to create shapes and patterns that reflect what is being said in the poems, and these arrangements of words perfectly complement the illustrations to give readers a singular reading experience. In the water we encounter box jellyfish, “fascinating” creatures that move around by “undulating” and “pulsating.” We see a sea turtle “row by” with “flippered wings,” and a king angelfish, which is territorial about her space. Among the coral, butterfly fish spend their days “floating, flitting, flickering, fluctuating feeding.” The peaceful harmony of their world is rudely interrupted when they have to flee from a hungry eel. Puffer fish, cleaner fish, needlefish, sea horses, Moorish idols, trumpet fish and others cover the pages of this special book. There are poems in rhyming verse, blank verse, a haiku, an acrostic poem, a tercet, a limerick, a riddle and more. Throughout the book Betsy Franco dazzles us with her remarkable word pictures and delights us with her creativity. Some picture books were clearly written just for children. Others will appeal to adults who love to look at beautiful art, or who like to give their imagination an airing. And then there are picture books that can be enjoined equally by children and adults because the message is so universal. Today's picture book is just such a title. Children will be drawn into the simple narrative and perhaps they will think about what makes them feel safe and secure. Adults may find themselves wondering what their sanctuary is too. Is it a place, a person, or something else altogether? When a group of people are asked what they think of when they hear the word “sanctuary,” each person will probably come up with a unique answer. For some, a cozy nook in a window seat might be a sanctuary, while for others their sanctuaries might be out in the fresh air, perhaps amongst trees in the woods or on top of a high hill. A sanctuary can be a solitary place under the covers where we hold onto a beloved stuffed animal so that we can have a quiet cry, or it can be picnic place in the woods where we go to play and laugh with others. This is the kind of book that children and grownups alike will enjoy sharing. It is a book that will give readers something to think about, and they will enjoy sharing the artwork, and the imagery in the words, with others. Until relatively recently, I had never encountered poetry that told uncomfortable stories from real life, stories that captured painful events from history. Then I started reviewing poetry books and I came across a few such titles, books in which the raw truth from the past is shared and explored. Today's poetry title is an example of this kind of book, and the poems it contains are powerful and honest. The history of the African American people is peppered with stories of struggle, loss, landmark moments and people of great courage. We know some of these stories well and think about them as the year rolls around, remembering how Rosa Parks took a stand on a bus, and how Martin Luther King Jr. gave a speech on a hot summer’s day in Washington D.C. However, there are many stories that we do not know, and in this book big stories and small ones are told to help us get a truthful picture of what it was like to be an African American in the days when people of color were discriminated against. The first story we encounter is about the schools Booker T. Washington founded, schools that gave black children the tools, it was hoped, that would allow them to succeed in the world. Not many years before, the children who attended the schools would have been horribly punished for trying to get an education, but now the door to the world of books, words and numbers was open to them. Soon after we read this story of hope we meet a woman sitting in the middle of a floor. She is a “Cleaning Gal” and she knows that she could get into terrible trouble for resting when she should be working. She knows that many tasks await her in the hours and days ahead, and that she has to work, and work hard, to provide for her family. She knows that while she labors away, her employers will live a life of leisure, a life she can only dream about. We read too about how many brave souls refused to accept the “WHITES ONLY” signs. They protested peacefully against segregation in five and dime stores and other places where they were not welcome, and were attacked and imprisoned for their pains. This powerful collection of poems will give readers a sense of what African Americans went through, and how they suffered over the years, oppressed by violence and Jim Crow laws. They were not beaten though, and rose up to march and sing, to speak and to shout out for justice. Many people have a hard time understanding why some adults love children's literature. Why would a grownup like to look at picture books, which are childish and surely too simple for an adult reader? It is true that some picture books have a simple story line, one that caters just for children, but there are others that present readers with a bigpicture concept, a story that explores a universal principal that will resonate with readers of all ages. Today's picture book is just such a title, and it is one that I have put on my to-look-at-again-and-again shelf. It is book that is beautiful on many levels. A little seed lands in the shelter of a big tree’s curved roots, and there it germinates and sprouts. Though it is “delicate and frail” the little tree begins to grow. Sheltered by its large and strong neighbor from the baking sun, heavy rains and snow, the little tree flourishes. And then, one night, a terrible storm blows through, and though it has withstood many a storm before, this time the older tree, the little tree’s protector, is not able to withstand the ferocity of the wind, rain and lightning. When the “uproar and confusion” passes, and the quiet returns, something is different in the little tree’s world. Its protector is gone. Big machines rumble and roar around the little tree and it is left to struggle in a wasteland without any other tree around or near it. Loss and change can be devastating, whether you are a tree or an animal or a person. With minimal text and incredibly beautiful illustrations the author and illustrator of this remarkable picture book helps readers to see the cycle of life, death and renewal in a powerful and life-affirming way. We see how the older generation protects the younger until the younger has to stand on its own and face what life sends its way. I had never seen an acrostic poem until my daughter wrote one at school and proudly showed me her creation. She went on to write many more such poems, and still occasionally writes acrostics, which she illustrates with her own drawings. This wonderful title shows young readers how these poems are written, and provides them with examples to read and enjoy. For many children, an acrostic poem is the first poem that they write. To create these poems poets use a word, written down the page instead of across it, to form the building blocks of their word creation. They then begin to write phrases that begin with the letters of that word that explore, in some way, what that chosen word means. For example, the first poem in this is book is built off the word “Acrostic.” The first letter of the first line is an A, the second a C, the third an R, and so on. The poem begins thus: “All kinds of poems are / Cool, but this type is / Really interesting…” Since rhyme and meter patterns are not required in poems of this type - though some of them do rhyme - acrostic poems are wonderfully simple to create. Children who have been afraid to try writing poems of their own are going to be inspired when they look through this book. They will see how easy it is to write acrostic poems, which can be funny, tell a story, or be contemplative, depending on the writer’s mood.